I love to sleep but don't always get a full nights sleep. I am continually tossing and turning, waking up in the middle of the night, or still feel tired in the morning. That's why I was thrilled to give ZzzQuil from the makers of Vicks Nyquil a try. ZzzQuil is not for colds, pain, or anything of that nature, it is just for sleep. It is non habit forming and should not be taken every day. It's active ingredient diphenhydramine HCI, helps reduce the time it takes you to fall asleep and wake up feeling rested. I had seen the commercials and advertising for this product but now I have a better understanding of what it is used for. 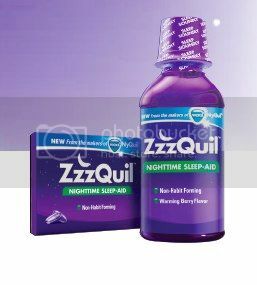 ZzzQuil comes in either liquid or pill (gel) form. We received the liquid form which is better for me in my opinion. I don't have trouble with taking pills but lots of times it's easier for me to swallow if it is in liquid form. The taste isn't too bad either. It kind of taste like cough syrup but in a lighter, more tolerant form. The recommended dosage is 2 tablespoons but I only took half of that. Only because I wasn't sure how my body would react to something new like this. I blog all hours of the day and sometimes I need help telling my body it's time to quit for the day. It didn't make me fall asleep right away but made it easier for my body to wind down. ZzzQuil was great for helping me feel more rested without feeling extremely tired in the morning. I did notice less tossing and turning during the night. I love that it is something that I can use occasionally and don't have to worry about me depending on it. ZzzQuil worked good for me but will it do the same for you? My answer is, everyone is different and you have to be the judge of that. Visit the ZzzQuil for more product information. Have you tried ZzzQuil? We would love to hear about your experience on twitter using the hashtag #ZzzQuilNight. You can also like Zzzquil on facebook!